The Memorial Candle Program has been designed to help offset the costs associated with the hosting this Tribute Website in perpetuity. Through the lighting of a memorial candle, your thoughtful gesture will be recorded in the Book of Memories and the proceeds will go directly towards helping ensure that the family and friends of Frank McBroom can continue to memorialize, re-visit, interact with each other and enhance this tribute for future generations. Graveside service for Frank McBroom, 69, of Godley will be conducted at 11:30 A.M., Monday, September 10, 2018 in the DFW National Cemetery. Pallbearers will be Justin Albright, Colt McBroom, Hunter McBroom and Noah Hyde. 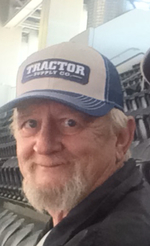 Frank McBroom passed away Monday, September 3, 2018 in Godley. He was born January 29, 1949 in Amarillo to Jack and Betty Jo Glover McBroom. He married Linda Gail Wander in 1986 in Godley. She preceded him in death on October 8, 2014. Mr. McBroom served in the United States Air Force for four years. He worked as a manufacturing engineer for Lockheed Martin, retiring with over 30 years of service. He was of the Baptist faith. Survivors include his four children, Rhonda Gail Groomer and husband Terry of Godley, Michael B. Groomer of Ft. Worth, Michael K. McBroom and wife Stefanie of Cleburne, and Wendy R. Taylor of Ft. Worth; mother, Betty Jo McBroom of Ft. Worth; eight grandchildren, Justin, Morgan, Colt, Hunter, Mackenzie, Ben, Noah, and Hillary; three great grandchildren, Jaylen, Teagan, and McKenna; two brothers, Jackie McBroom and wife Sharon of Denton and Robbie McBroom and wife Sandra of Ft. Worth; and numerous nephews. He was also preceded in death by his father. Memorials may be made to: Wounded Warrior Project, P.O. Box 758517, Topeka, KS 66675. To send flowers to the family of Frank McBroom, please visit our Heartfelt Sympathies Store.